Governor Pence continues to deceive the public about this deeply flawed law. Let’s clarify a few things. Gov. Pence myth: SB 101 is just like Illinois law that then-State Senator Obama voted to support. Truth: Gov. Pence fails to point out that Illinois has robust nondiscrimination clauses in its state Human Rights Act that specifically protect LGBT people. Indiana does not. This matters because those seeking to discriminate in Indiana may claim that the lack of a statewide law barring sexual orientation and gender identity discrimination means that there is no compelling state interest in enforcing local ordinances providing such protections. Gov. Pence myth: This law only reinforces established law in Indiana. Truth: The language in SB 101 is so broadly written that someone can sue even without their religious beliefs having actually been burdened simply by claiming that is ‘likely’ to happen. Gov. Pence myth: SB101 is just like federal law that President Clinton signed 20 years ago. One other very important point is that almost all of those state laws were enacted before gay marriage became legal in a majority of the states. 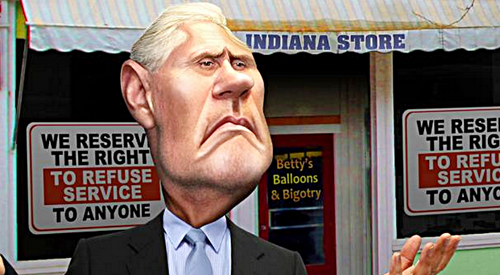 The Indiana law is a direct result of bigotry and opposition to gay marriage. Too bad this all won’t fit on a bilboard.